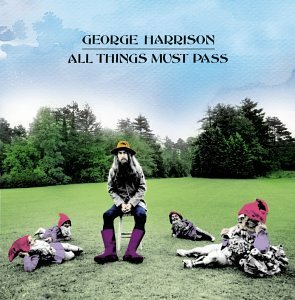 Of all the Beatles debut solo releases, 'All Things Must Pass' was the most successful. Indeed it was an auspicious start of a solo career for George. He'd been collecting material for a couple of years before hand and compiled it all in 1970 for a triple album set and with the Beatles break up he released it. Many of the musicians backing him on the record couldn't be legally credited at the time and there were far too many comings and goings of musicians to say who actually played what instrument on what track. What is fairly certain is that Ringo Starr and Eric Clapton were on the album with the rest of the soon-to-be Dominoes, Badfinger, Billy Preston, Pete Drake, Alan White, Klaus Voorman, Gary Brooker and Gary Wright. What is not fairly certain is the urban legends that have been perpetuated over the years. Harrison remembers that Phil Collins played congas on 'The Art of Dying' and somebody remembers seeing Maurice Gibb of the Bee Gees who was a mate of Ringo's there and he may have played something. Alan White then dropped a bombshell by saying that John Lennon may have played on 'If Not For You'. The album continues to this day to receive universal acclaim but in the 2001 30th anniversary re-release Harrison regretted Phil Spector's co-production, stating that there was "Too much echo". The cover itself was a talking point in itself with Harrison sitting in his Friar Park garden among four gnomes. The message is pretty clear: the four gnomes are representative of his former band and George is above it all. 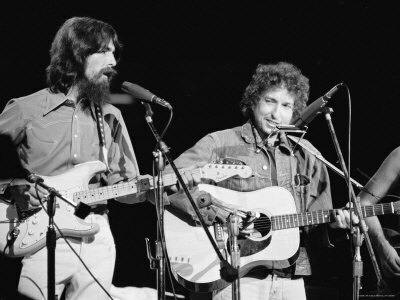 Lennon commented that Harrison looked like "an asthmatic Leon Russell" on the cover and took offence to the supposed message but at that time, Lennon was being a brat about all his former bandmates solo albums, especially McCartney's. Harrison and Dylan wrote 'I'd Have You Anytime' together. The album's smash hit single was the subject of a plagiarism suit. 'My Sweet Lord' was deemed by the Bright tunes corporation to have too many similarites to the Chiffon's 1963 hit 'He's So Fine' which they owned. It went to trial in 1976 and George's manager Allen Klein actually purchased Bright Tunes during the suit, effectively becoming the man that was suing George. It all worked out in the end though as the court ordered that Harrison buy Bright Tunes himself and become owner of 'He's So Fine' which he did.